Home Crime DOSSIER PERATOVIĆ I: Assassination of Đureković was outside of protocol? Newspaper stories that possess real value are the ones that produce effect. They are the ones that lead to change. That is the very essence of journalism – the effect and changes they evoke in society. Željko Peratović commenced his career as a professional journalist in June, 1991 in Croatian daily newspaper Vjesnik, starting to report on the state of war in Slavonia. At the beginning of his career Peratović was faced with his first big dilemma: “In that initial phase, when reporting from the battlefield, you want to participate. You want to be part of the defence. You want to contribute to the fight for homeland. You want to somehow make a written monument to the people you share the front line, the battlefield, the bread in combat. You share the good and the bad. That leads to self-censorship. Self-censorship is fatal for a journalist, as well as for the public, which in the end receives the information. 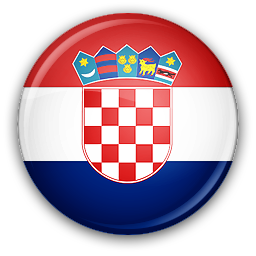 My position back then was that Croatia was a victim, unorganised and underprepared for battle with a trained and well prepared enemy. That was the reason why, some of the things I didn’t personally witness but had indications that something was happening, such as crime, autocracy, corruption, robbery, I simply decided not to investigate further or emphasize in my stories. . But that can only last so long if you have a conscience. All sorts of situations play out in front of you, heroes become criminals, people disappear and get murdered in mysterious circumstances. Witnesses get threatened, guns placed at their foreheads. Today when I look back, I can say that pure luck saved me on a couple of occasions, because the weapons and my potential executors were ready. Basically, the wrong question at the wrong place could cost you your life. So, I quickly learned that the newspaper stories that possess real value are the ones that speak about those issues. They produce effect. They lead to change. And for me as a journalist, that is the very essence of journalism – the effect and changes they evoke in society”. Fall of Vukovar. The first war tragedy which had an almost live coverage by the media, was a topic that Peratović couldn’t let go. At the very beginning of the war events, he conducted a brief interview with the military commander of Vukovar. At the time, he wasn’t allowed to name his interviewee because of war related censorship. Reporting guidelines at that time indicated that media were not allowed to publish any information on the war events that the enemy could use. But his interviewee was Mile Dedaković Jastreb (Hawk, author’s comment). The interview was conducted in Vinkovci, right after Dedaković left Vukovar due to the orders from Zagreb. A little over a month after that interview, Vukovar fell. TV screens showed images of horror. Mile Dedaković Jastreb and Branko Borković, commanders of defence of Vukovar were arrested under the charge of performing a coup d’état. They were charged for all kinds of things. Ranging from the responsibility for the fall of Vukovar to cooperating with the enemy intelligence agencies (i.e., KOS – Yugoslav Army Counterintelligence Agency), robberies, harming of soldiers and civilians. Shortly after the press conference Mile Dedaković held in Zagreb (after he got out of detention), where he blamed highest state leaders at the time for fall of Vukovar and its casualties, I was approached by Hidajet Biščević, editor in chief of Vjesnik at the time. He suggested that I, (stating that I know Dedaković from the previous interview) can do an interview with him. I was a little taken aback by such a proposal, considering that I had not been present at the press conference and had not followed everything Dedaković said after he had been released from detention. However, as I thought it was a story that needed to be told, I immediately got in touch with Dedaković and conducted the interview. But in the next issue of Vjesnik, the interview was not published. With no further explanation. I felt bad because those were the stories that can change a society. That can change the course of war, and in the end that can change Croatia’s destiny as an emerging state. My opinion was that those were the topics we needed to face. Seeing that, at the beginning of the war, Slovenian media reported regularly about the state of the battlefield in Croatia, I gave the article to magazine Delo from Ljubljana. They published it in a shortened version because they were a different type of newspaper. But for me it was important that the interview gets out. At any cost. 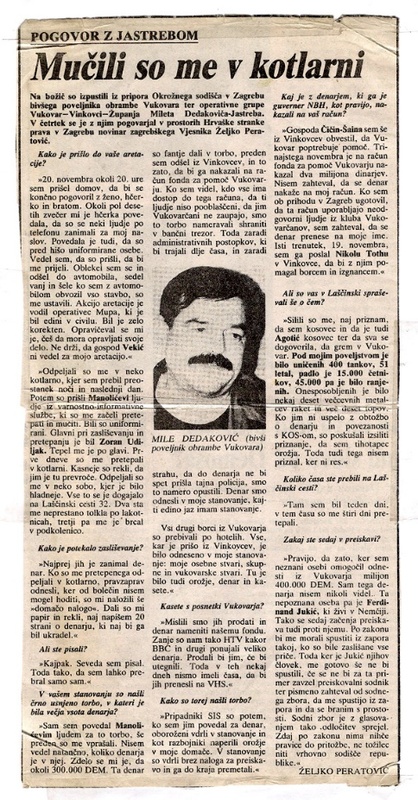 Shortened version of the interview with information about the fall of Vukovar was published by Delo from Ljubljana under the title Mučili su me v kotlarni (They tortured me in the boiler room, author’s comment). In the interview Mile Dedaković said that armed members of SIS (Security and Information Service of Ministry of Defense) broke into his apartment without a search warrant, arrested him and held him in custody for a week. Dedaković pointed out that he was relentlessly beaten and tortured for four days. He suggested that he was arrested under orders of Josip Manolić, head of UZUP (The Office for the Protection of Constitutional Order) at the time, and questioned about variety of related and non-related issues such as the money they found in his apartment (300 000 Deutsche Marks). According to Dedaković, he received the money in question before he departed Vinkovci so he could deposit it in the bank and transfer it to the account of Fund for Vukovar. Besides money, original tapes of recorded events and weapons from Vukovar were also found in his apartment. Dedaković’s defence was that all those things were, after exiting Vukovar, brought to his apartment because other defenders did not have any secure place to store them outside of Vukovar. In the interview he also stated that he was tortured in detainment in order to confess he was a member of KOS and that he smuggled guns. Dedaković stated as well, that an investigation against him was commenced because he had allegedly helped an unknown person carry out a million and four hundred thousand Deutsche Marks from Vukovar. 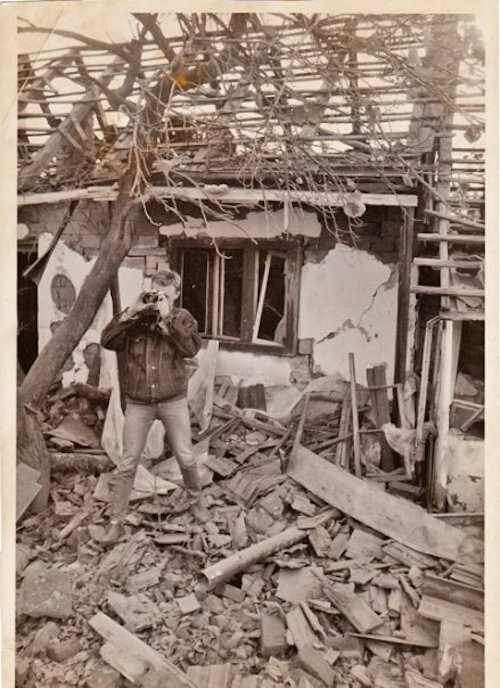 Peratović as a war reporter in Nuštar near Vukovar in October 1991. Photo taken by Romeo Ibrišević. Dedaković even today does not have any confirming documents regarding that arrest and detention, because the report states that he had been injured in a traffic accident. Also, neither Dedaković nor Borković have evidence they were incarcerated. Josip Manolić and Josip Perković, head officials of SIS at the time, led the investigation against us, Borković stated and continued: the report of the State Commission regarding the preparation and management of defence of Vukovar was composed in November and December of 1991. It was signed by Josip Manolić, chairman of that commission. The report is a 50 page chronological description of the defence of Vukovar. According to that point of view, Mile Dedaković – Jastreb and the people around him (therefore, including me) were involved in conspiracy supported by Yugoslav intelligence services in toppling of the Croatian legal constitution. Borković stressed that, “report from the commission in question is still a legal document of the Republic of Croatia and no government since that time, in order to reveal the truth, wants to introduce the public discussion about it. Besides the fact that at the onset of his career journalist Peratović sent a clear message that he will find a way to publish an important story in any way possible, another circumstance determined his professional future. In his first big article that didn’t get published, Peratović in his story touched on a name that would end his journalist career – name of Josip Perković. Assassination of Đureković was outside of protocol? 15 years after the events in Vukovar (July, 2005), Peratović conducted an interview with Pavle Gaži, socialist Minister of Interior in Socialist Republic of Croatia (1982/1983) in the light of the arrest of a former Yugoslav Secret Service agent Krunoslav Prates in Germany. An interview with a political heavyweight from the communist era, titled “Assassination of Đureković was outside of protocol?” supposed to be the highlight of Peratović’s journalist career. However, Vjesnik’s editor in chief at the time, Andrea Latinović, same as her predecessor Biščević in case Dedaković, banned the publishing of the interview without any special explanation. Peratović’s reaction was identical to the one from Vukovar war times; he offered the interview to other papers and finally the interview was published by Feral Tribune (independent weekly magazine at the time). Immediately after the article was published, Željko Peratović’s contract with Vjesnik was terminated, with the explanation that he had violated terms and conditions of the contract by publishing an article outside his head journalist company, without the knowledge of Vjesnik’s editorial. 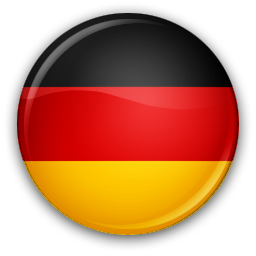 Fairpress will cover those events in detail in the sequence of the feuilleton. From today’s aspect it is important to determine a few facts from that period. What was the actual truth behind those events? Was the information stated in the article so dangerous for power holders at the time that they would never let it out to be published? Or was the article simply of poor quality and it was a legitimate editorial decision not to publish it? Pavle Gaži was, at the time of the assassination, Minister of Internal Affairs and superior to Josip Perković, who was among senior Secret Service Officials in both socialist Croatia and after the fall of communist regime in the new democratic state. In the interview that Peratović conducted, it leaked that Gaži, prior to assassination of Stjepan Đureković in Germany, possessed a dossier on criminal dealings in INA concern which he forwarded to the republic prosecutor at the time. In those documents, among others, name of Vanja Špiljak, the son of Mika Špiljak, emerged. Mika Špiljak was, at the moment when the affair broke out, a member of the Presidency of the Central Committee of the Communists Party of Croatia, and was preparing for his entrance into the Presidency of SFRY (Yugoslavia). According to the documents in Gaži’s possession, Federal Financial Inspectorate in Belgrade had already initiated pre-investigation in the INA case at the beginning of 1982 based on suspicions for malpractice of INA management that inspectorate discovered during the routine check of the big state owned companies. However, Mika Špiljak had found out about the investigation from the Central Committee of the Communist Party of Yugoslavia (KPJ) and wanted to prevent the investigation of his son Vanja which could have affected his career. In those dramatic moments, according to Gaži, Špiljak feared the most a potential statement from Stjepan Đureković, who was one of the INA managers (manager for public and international relations), and who left Yugoslavia right before the affair broke out. An especially inconvenient and dangerous situation for Mika Špiljak was that Gaži as Minister of Interior had already made contact with German authorities regarding Đureković’s possible return and testimonial in the potential proceedings against Vanja Špiljak related to INA case. But, the epilogue was that Stjepan Đureković was murdered in Western Germany at the time, and Pavle Gaži forced to resign from the position of Secretary for Internal Affairs and kicked out from the Communist Party. In the interview with Peratović Gaži said: This is why I believe that the murder of Stjepan Đureković was agreed upon and carried out on an informal level of power. After that, the legal proceedings related to our investigation with the oil malversations of which I had spoken stopped and I was put on hold. Consequently, Milutin Baltić, who became President of Presidency of Federal Republic of Croatia, told me in September that I had to resign, which I did. The key issue Gaži discusses is that the assassination of Stjepan Đureković was not a “standard” political assassination, like some other done by the UDBA (Yugoslav State Security Service). In other words, from the conversation Peratović conducted with Gaži, the impression is that Josip Perković and Zdravko Mustač abused their positions within the State Security Service and organised the assassination of Stjepan Đureković “off-protocol”, i.e., they bypassed the official protocol regarding authorisation of that killing in order to help their friend and probable political guardian Mika Špiljak. Twenty years later, in 2005, Peratović writes about those events. And that is an article that will end career of Željko Peratović. Name behind the scene, same as back then, is Josip Perković. I wouldn’t feel regret even if I had lost the lawsuit for mobbing because that interview is crucial in a verdict and an indictment, and that is exactly what we investigative journalists aim for; an epilogue of a sort. The spirit of Peratović’s article is alive again. But, not everything is simple and easy in this case. However, that is an issue to be discussed in the next sequel of our feuilleton.